just 3 of these at this price.from amazon warehouse described as used like new.unbeatable price considering the non warehouse new price. Bought one about 2 years ago, those of you who love coffee and are on the fence due to it being expensive, get it. It's genuinly the only thing ive bought that gets as much use as the tv, consoles, mobile and car. Well worth it. All your mates will be coming over for a coffee, unless you're like me and don't have any mates lmao then get your mum over. I'm talking from personal experience, Amazon do send out broken machines. Apparently broken grinders equal "as new"
I'm talking from personal experience, Amazon do send out broken machines. …I'm talking from personal experience, Amazon do send out broken machines. Apparently broken grinders equal "as new"
that is fair enough but if it comes broken just send it back.amazon will even pay for the postage. 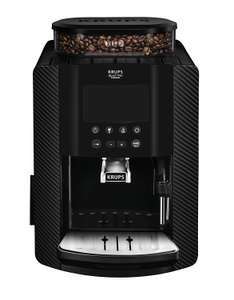 Bought one about 2 years ago, those of you who love coffee and are on the …Bought one about 2 years ago, those of you who love coffee and are on the fence due to it being expensive, get it. It's genuinly the only thing ive bought that gets as much use as the tv, consoles, mobile and car. Well worth it.All your mates will be coming over for a coffee, unless you're like me and don't have any mates lmao then get your mum over. yes £259.49 as new great spot.get it at that price a bargain. only one in silver as new if anybody wants it. Best thing I've bought for the kitchen, use it all day long. Couldn't live without it. Seconded Delonghi's are very well designed, especially the grinder mechanism which is usually the part that fails in bean to cup machines. They have a warehouse full of 2nd hand Melitta SOLO E950-222 again already. I'm not sure what conclusion to draw from that. They have a warehouse full of 2nd hand Melitta SOLO E950-222 again …They have a warehouse full of 2nd hand Melitta SOLO E950-222 again already.I'm not sure what conclusion to draw from that. got one delivered today from warehouse described as like new was brand new.nearly half retail price.